The Safe-T-Sport Neoprene Knee Brace with Composite Hinges, by Jobst, is a knee support designed to provide both comfort and sturdy construction. The hinged feature is an added safety precaution to protect a tender knee that may be either healing from an injury, or simply needs proper alignment support as a precautionary measure. The Safe-T-Sport composite structure is a unique ultra-light space-age material -- much lighter than metal, yet maintains a high degree of strength and support both lateral and medial. The composite hinges are safely covered by the outer neoprene pockets stitched into both sides of the device, so the wearer can safely slip this through the leg and over the knee. This knee support involves a thin neoprene with nylon terry liner for a soft, seamless feel against the skin. It is ideal for use on swollen or tender knees resulting from sprains, strains, injuries, arthritis or post-operative rehabilitation. The lightweight neoprene provides consistent compression and therapeutic warmth. It also includes a horseshoe support embedded in the area below the kneecap to aid patella tracking. The lightweight composite hinges allow for flexion while limiting medial/lateral movement and preventing hyperextension. It is a pull-on style leg sleeve and is secured with two loop lock adjustable straps so slipping this one and strapping it tight is quite easy to do. The device can simply slip through the leg over the knee. The space-age composite materials are light, yet very strong. The two straps make adjusting tension easy to do. It will help stabilize a knee to aid healing or maintain stabilization. 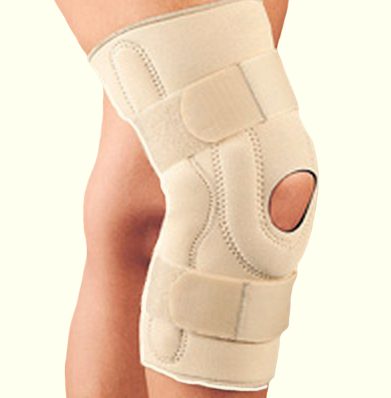 It comes with a stop to prevent hyperextension of the knee.